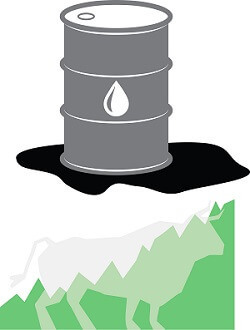 Most crude oil price predictions for 2016 are overwhelmingly bearish. Wall Street is particularly gloomy as both Goldman Sachs Group Inc. (NYSE: GS) and Morgan Stanley (NYSE: MS) forecast oil to hit $20 a barrel sometime this year – down more than 35% from its current $31 price. On Jan. 10, Royal Dutch Shell Plc. (NYSE ADR: RDS.A) CEO Ben van Beurden said he's confident crude oil prices won't stay low for long. The bullish statements come ahead of a Jan. 28 shareholders meeting, which will finally decide whether or not the Netherlands-based oil giant merges with BG Group Plc. (OTCMKTS ADR: BRGYY) in a $51 billion deal. "The oil prices we are seeing today are not sustainable and are going to settle at higher levels, and higher, in my mind, over the next few decades than the low $60s that we require to make this deal a good deal," van Beurden told The Sunday Times over the weekend. Shell announced its acquisition of BG Group last April. The deal marks the largest merger of two energy companies in over 10 years and will create the single largest natural gas producer in the world. The Shell-BG megamerger is part of a larger merger and acquisition (M&A) wave washing over the oil sector right now. According to Money Morning Global Energy Strategist Dr. Kent Moors, the low crude oil price environment will incentivize companies to merge and make the sector more consolidated. This will reduce the number of U.S. producers and birth a new group of heavyweight companies that will strengthen oil prices in 2016. "The Shell-BG [transaction] is the first clear megamerger option crossing the oil-gas division," Moors said last April. "We will see more of these as the new energy balance among a widening number of energy sources kicks in."